Get back to the basics of the Christian faith with this small plain cross pendant. Apples of Gold presents a simple symbol to remind you of the sacrifice of Jesus every day. The plain gold cross pendant is forged of 14K white gold to keep with modern jewelry fashion. The cross is unadorned but still a powerful emblem of faith. The plain finish of this cross pendant is perfect dose of humble style into your jewelry collection. 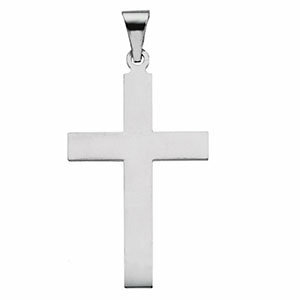 We guarantee our Small Plain Cross Pendant, 14K White Gold to be high quality, authentic jewelry, as described above.